Baleen is a keratinous structure attached to the upper jaw in some whales and is used to filter out water while feeding. Evolutionists see this unique arrangement as “highly derived” or apomorphic, meaning it’s an evolutionarily advanced character state. Baleen is certainly advanced. Baleen, in all its complexity, has always been baleen—no evidence of it having evolved from something else has ever been found. Evolutionists counter with a creature called Aetiocetus, suggesting that this extinct genus somehow possessed both teeth and baleen, but the presence of baleen in Aetiocetus fossils can only be inferred—there’s no fossil evidence for this ambitious claim. Michael Benton’s 2015 edition of Vertebrate Paleontology does not mention this supposed crucial transition at all. The authors presuppose evolution and unfortunately force this interpretation on Llanocetus saying that it had well-developed gums (whatever that means), but no baleen. But if it had no baleen, why call it a mysticete (a baleen whale) in the first place? What has been discovered is a gigantic creature (Llanocetus denticrenatus) that is designed not with baleen but with “notably worn teeth.” The authors conclude by stating, “We interpret Llanocetus as a raptorial or suction feeder, revealing that whales evolved gigantism well before the emergence of filter feeding.” It appears the evolutionary story of whale evolution must be changed yet again to fit the evidence. Each whale kind was created unique and did not evolve in some mythical man-made progression as evolutionists portray. The best interpretation of this fossil is that the carcass of this poor hapless toothed whale was buried catastrophically in late global flood sediments which ICR geologist Dr. Tim Clarey has shown correspond with the Tejas megasequence.5 The reason that the fossil appears suddenly, and out of order according to evolutionary expectations, is that each whale kind was created unique and did not evolve in some mythical man-made progression as evolutionists portray. 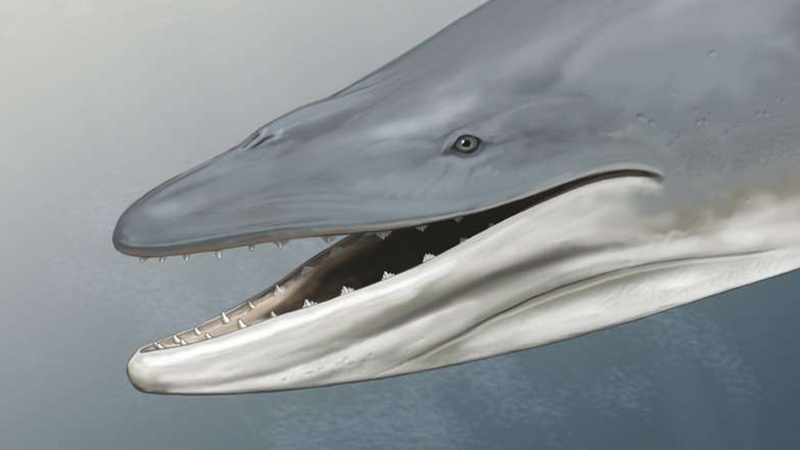 Baleen whales have always had baleen, and toothed whales have always had teeth. Bryner, J. 2009. Ancient Whales Gave Birth on Land. LiveScience. Posted on livescience.com February 3, 2009, accessed May 18, 2018. Fordyce, R. E. and F. Marx. 2018. Gigantism Precedes Filter Feeding in Baleen Whale Evolution. Current Biology. 28 (10): 1670-1676. Thomas, B. Organ Discovery Shows Why Whales Didn't Evolve. Creation Science Update. Posted on ICR.org June 22, 2012, accessed May 30, 2018. Stage Image Credit: Copyright © 2018. Carl Buell. Used in accordance with federal copyright (fair use doctrine) law. Usage by ICR does not imply endorsement of copyright holder. *Mr. Frank Sherwin is Research Associate, Senior Lecturer, and Science Writer at the Institute for Creation Research and earned his M.A. in zoology from the University of Northern Colorado. Dr. Jeffrey Tomkins is Director of Life Sciences at the Institute for Creation Research and earned his Ph.D. in genetics from Clemson University.